This was a relatively short project taking about 10 hours to complete. I created it mainly to develop my physics simulation skills. 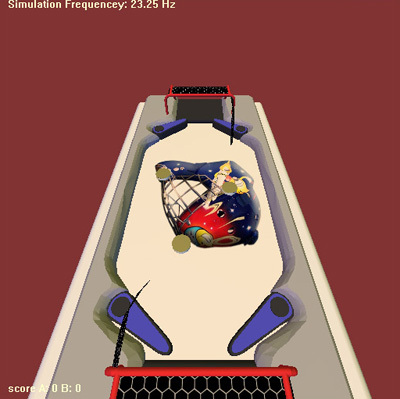 An air hockey game is unforgiving of inaccurate physics, and is a decent way to test a good few physics situations. It uses a realtime physics system to simulate any number of pucks on a table. Euler integration is used to ensure that the pucks and flippers respond in a realistic fastion. Elastic collisions are used for puck-to-puck and puck-to-flipper collisions. The collision time is found to a high precision by subdividing the timestep if a collision has been detected. This means that precision is maintained along with a high performance. To prevent energy explosions and for a sustained realistic motion, a small amount of friction is applied to the pucks that are in motion. Look at the video below to see the game in action.